Sunday, in a two-pronged operation, the McGill University Health Centre (MUHC) completed the largest and most complex hospital transfer in Canadian history. The day began at 8 a.m., with the transfer of the hematology/oncology and palliative care inpatient services from the Montreal General Hospital to the Glen site. Following the same rigorous methodology established for the respective moves of the Royal Victoria Hospital and the Montreal Children’s Hospital, 21 patients were safely moved in a seamless operation which lasted 2 hours 46 minutes. 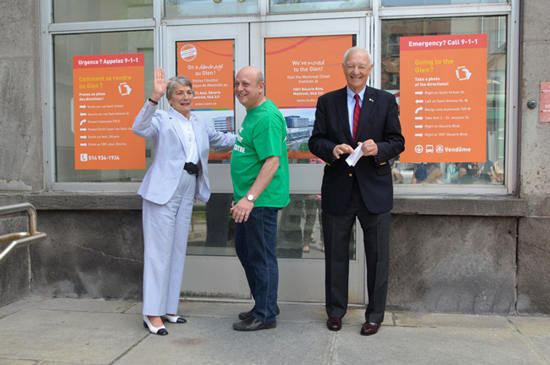 “As with every one of our patient moves, our number-one priority was to ensure the calm, methodical movement of all patients without ever compromising their care or safety,” said Patricia Rose, Senior Advisor, Redevelopment for Adult Sites and Patient Transfer Coordination Committee co-chair. 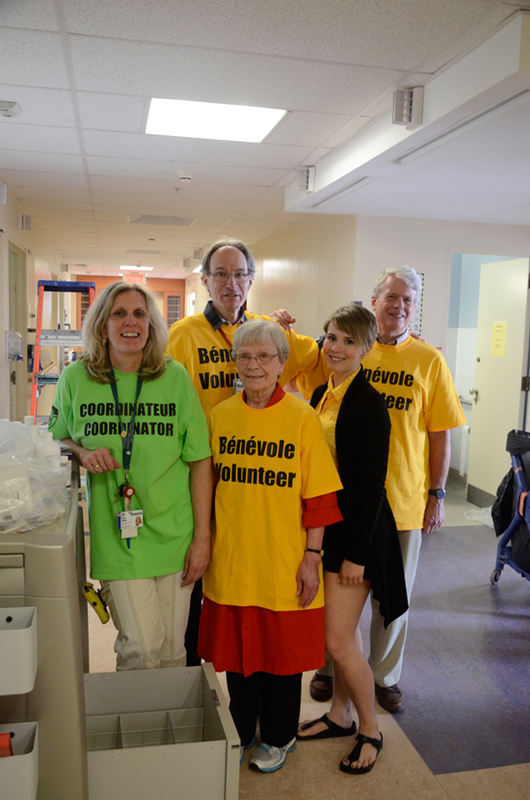 “Once again, the success of this move can be attributed to the tireless efforts and skill of MUHC employees and doctors, staff from Health Care Relocations (HCR), Urgences-santé paramedics, Medicar technicians and all of our volunteers,” continued Rose. “Command centres at the Montreal General Hospital and the Glen site once again helped ensure the continuity and quality of patient care.” The Ville de Montréal, the City of Westmount and the SPVM also played important roles during the operation. The relocation of the Palliative Care and Hematology-Oncology units to the Cedars Cancer Centre at the Glen site will provide patients with some of the finest medical facilities in the country and conveniently offer cancer patients and their families everything they require all in one location. In addition to the state-of-the-art Radiation-Oncology Department and Oncology Day Hospital, the centre also comes complete with ambulatory clinics, a medical physics department, an oncology pharmacy, and a palliative care day hospital. Additional holistic benefits include healing green spaces, such as a tranquility garden; and the Adult Resource Centre, a quiet haven for those needing to access its vast library of important health information or support groups. Remaining in the heart of downtown Montreal, the Montreal General Hospital will continue to fulfil its Level 1- Trauma centre mandate and continue to play a vital role within the MUHC. The Montreal General Hospital’s services continue to be modernized and upgraded with the recent creation of a psychiatric emergency and short stay unit,” said Ann Lynch, Associate Director General, Clinical Operations, Adult Missions. Later that afternoon, 17 inpatients were transferred safely from the Montreal Chest Institute (MCI) to the MUHC’s Glen site. That move took less than two hours. The MCI at the Glen site has been designed explicitly to provide a range of specialized services in respiratory medicine. Ambulatory clinics and the day hospital, for example, will evaluate and treat respiratory diseases including chronic obstructive pulmonary disease, asthma, tuberculosis, sleep disorders, cystic fibrosis and lung cancers. The MCI’s central location within the hospital complex means it has direct and easy access to nearby departments, such as the adult emergency department, medical imaging, and our ambulatory test centre. This will allow respiratory care teams to provide patients with effective and accessible interdisciplinary care. “It’s hard to believe but just a short while ago we got the keys to the Glen site and started the activation process so that we’d be ready to move services and patients from the Royal Victoria Hospital, Montreal Children’s Hospital, Montreal General Hospital, and Montreal Chest Institute between February and June,” remarked Normand Rinfret, President and Executive Director of the MUHC. “I am immensely proud of our teams, especially for ensuring the safe and smooth transfer of 273 patients as well as the continuity and quality of care across all our hospital sites. “It’s impossible to explain the full scope of this undertaking. All I can say is that it was teamwork at its best and I look forward to thanking them in person during our June 19-21 Inauguration Celebration weekend,” said Rinfret.